I was delighted when it all was settled that I would come to Munich, Germanyto go to Vezelay with the German group. We had a good time together and it was nice to get to use my German again since I haven’t been able to use it that much in the last years. It was wonderful to get to know the other guys in the group and that I think is the best part of Scouts of Europe, to be able to become like brothers to your fellow scouts. I truly enjoyed the spontaneous rugby game, it was great fun! I also met some old friends from a rover’s training hike I went to in France this summer and it was lovely to meet them again. I think also that it’s good to go for hikes to be able to ponder where you’re going in your life and to get away from the noise of one’s usual busy life. 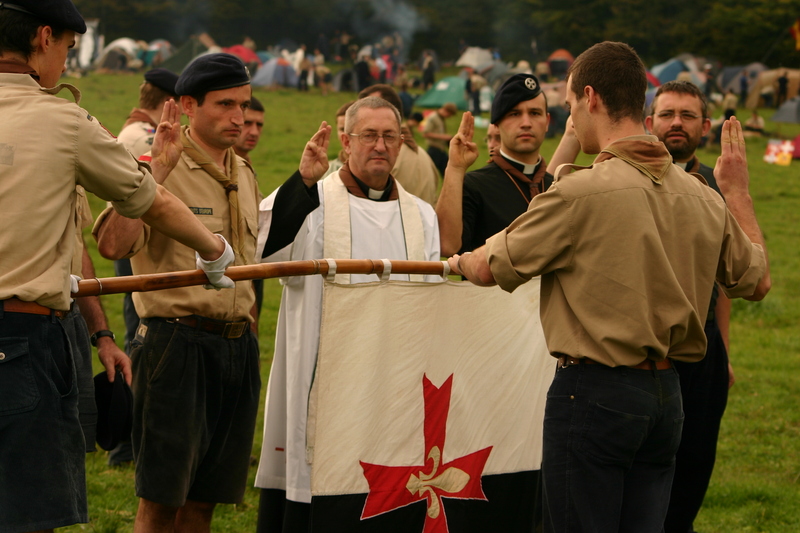 Scout’s of Europe is truly a wonderful organisation that we are united in many things, faith, uniforms and ceremonials, still we are all unique and also children of our nations and it’s a pleasure to discover European culture. After the closing ceremony I went out of the Church with the rest of the Germans to finally say my promise which I had planned for a long time. It was absolutely perfect to do it with the Germans in France, not only because I know German, but also because of the symbolic value of course, since the FSE was founded by Germans and France is the country with most members and where the organisation also is very vibrant. I am very thankful for having had this opportunity to come to Vezelay and we would be very thankful for all prayers for developing FSE Europaspejarna in Sweden (Europaspejarna is our translation of Scouts of Europe)! I will attach a photograph from my promise, but please have a look also if there are any other photographs you’d like in full resolution.